The conference was organized by European Law Students’ Association (ELSA) and took place on April 16th-17th in Kharkiv, Ukraine. 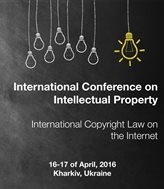 The conference was dedicated to explore the topic “International Copyright Law on the Internet”. The speakers of the conference mainly focused on Intellectual Property protection in the sphere of IT. Based on case studies and practical examples the following issues were discussed: protection of the software and writing code; domain name disputes; piracy matters; copyright objects in the digital sphere, managing copyright objects, etc. Also there was a discussion concerning the association of Ukraine with the EU and the draft laws of Ukraine in the sphere of copyright protection in the Internet. We were pleased to participate in the in-depth discussions on the matter and to share best practices concerning IP protection in the rapidly developing digital environment.